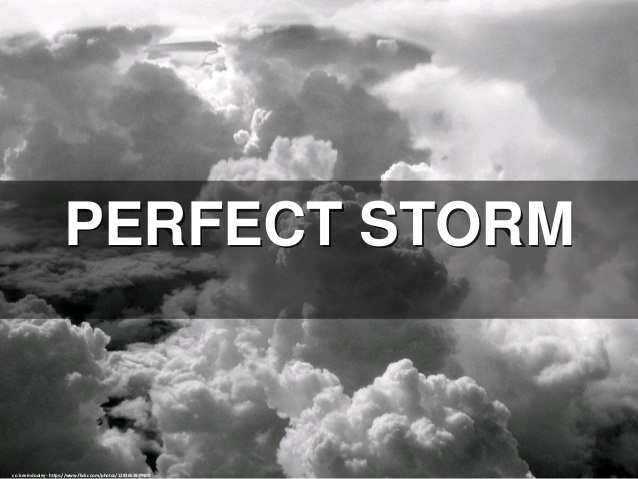 JoAnn Corley-Schwarzkopf | NewSchool Management: It's the Perfect Business Storm - Are You Prepared? It's coming...are you ready? I remember seeing the movie The Perfect Storm, and still have memories of the climate conditions building that created such a catastrophic event. (If you've not seen the movie, it's worth it to rent!). The perfect storm I'm referencing is the business storm brewing, the one far beyond the horizon, difficult for the untrained eye to see, yet is building as we speak. It's a storm that could potentially whip your business into a frenzy, crippling profits for a substantial period of time. Clearly it's an emerging storm to which every business leader must pay attention. And, as it's forming, in the spirit of preparation, there are 2 critical sets of questions that needs to be considered. Is my company vulnerable to the storm? And if so, in what ways? The answer to these questions will in fact describe why it's a perfect storm and what comprises it. First, let's look at the definition: a particularly violent storm arising from a rare combination of adverse meteorological factors. 1. The now largest population of employees ever that make up the labor pool are millennials. They have a strong orientation and very specific sensibility to relationships with team members, leaders and company culture that define the quality of their work experience. 2. Companies have leaders and managers who are baby boomers, matures and older Xers, many of whom are not oriented this way, don't see the need or appreciate the value of this type of work experience. In fact, many are resisting this new workplace reality! 3. The labor market is tightening. Reported today, the unemployment rate is now at 4.6%. It's the lowest in several years. That means there will continue to be less candidates from which to choose and when they are hired, many companies don't have the management or culture to retain them -- to in fact give them the experience they are seeking and expecting. 4. A new administration looks to spur substantial economic growth, exacerbating the labor shortage. As the labor market continues to tighten, it will support and validate a generational approach to employment, "If I don't like this job, I can quit and go find another." The millennial generation tends to have no problem leaving a job without having another if their work experience is not satisfying. So, with a tightening market, they know they will easily be able to find a job and company more to their liking. 5. Dated views and beliefs on how to spend money (allocate financial resources) to manage talent for better company performance. (I address this in my latest executive briefing release Show Me The Money!) The old model for spending money is spend on operations, spend a little on employees. The new model is spend more money on employees to have better operations. The new mantra?, "Happy employees = better operations = more company profits." There are many companies who, in addressing the needs of the largest employee population, have been paying attention to their cultures and their leadership /management effectiveness. They have been diligently working on ways to improve the employee experience with an eye towards recruiting, engagement, and retention. Those who have been active in this way, whether they are aware or not, are shoring up their business for the storm to come. These efforts are strengthening their company's infrastructure to weather the operational challenges sure to come. 1. Do you have the kind of culture to retain and leverage the talent of the new workforce? 2. Are you as a key decision-maker resisting reality? 3. Are your leaders and managers resisting this reality? 4. What updated leadership/management development initiates have been implemented to address this need? 5. What new leadership/management competencies will be needed to successfully lead? 6. How have you been collectively preparing your company culture to fully integrate all generations to mitigate poor collaboration which creates operational bottlenecks and undermines profits? 7. Does your financial spend reflect a response to this changing workforce landscape? 8. Are you well insulated from or even remotely prepared for the storm? The answers to these questions are a valuable resource for your 2017 plans. Consider this post a foghorn warning of the storm to come. We know it's coming! We just don't know how fast. This year, many of my clients have already felt the pre-storm raindrops and we're helping them make preparations...are you?